01:21 – Directors, well at least Rich Moore in this case, don’t get residual checks when this episode airs. Wah wah. I love the complexity and elegance of the bullies’ plan: They set up Bart to be the fall guy, using an elaborate scam, requiring patience and intelligence that gave them plausible deniability. Smithers’s boss-note the correct punctuation and the spelling of perfidy–would be proud. 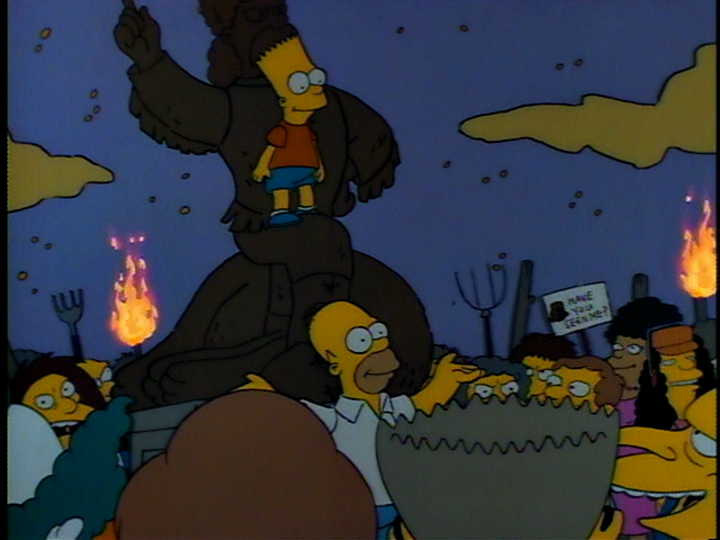 I remember watching this episode the first time: I was young and the show had not established that the Simpsons were invincible, so there was some tension as the lynch mob formed around Bart. I was very interested to learn how such a situation had happened, and satisfied by the answer. This episode is probably the best of the first season, and a sign of things to come when the Simpsons moved from its superfluous beginning to the peak that was seasons two through seven.